The “XI Gallery” has recently opened in New York’s Meatpacking District – a hybrid art installation and showroom for architect Bjarke Ingels’ luxury residences and a hotel under construction at “The XI” (pronounced The Eleventh) building a few blocks away. Its feature commanding most attention, from both invited guests and the street, is a curiously-shaped, 33-ft wide model of Lower Manhattan, comprised of more than 10,000 miniature 3D-printed and hand-cut buildings. 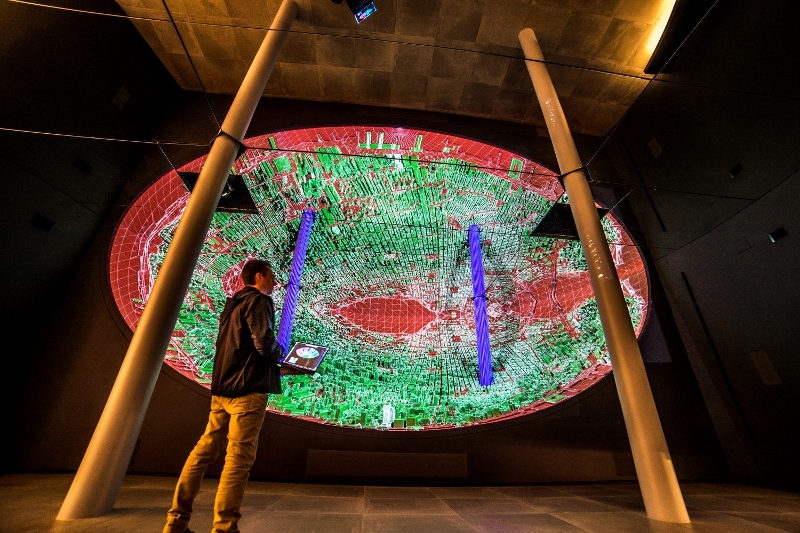 Technology West Group installed and commissioned 7thSense Delta Media Servers to bring projection-mapping life to “The Egg”. Es Devlin – renowned for her stage design for theater and artists such as Beyoncé and Kanye West, her pieces at Victoria & Albert Museum and Art Basel, an Olympics closing ceremony, and most recently a projection-mapped story at the Cannes Lions Festival of Creativity – is the artist behind The Egg and two other pieces in the gallery.